Avengers: Infinity War, not exactly a light-hearted frolic through the fields in the first place, could’ve been a whole lot darker. Yeah, I know. Don’t take my word for it: the SFX team behind the MCU’s biggest movie has confirmed that one change from a crucial Thanos moment means we were just given a heartbreaking scene instead of a downright terrifying one. Speaking to /Film, visual effects supervisor Dan DeLeeuw reveals that Thanos’ post-snap scene with Gamora in the Soul Stone was originally far grimmer than the one we were given. As the Mad Titan walked towards the younger version of Gamora, the orange hue of the Infinity Stone was meant to be replaced by a river of blood. Nasty. 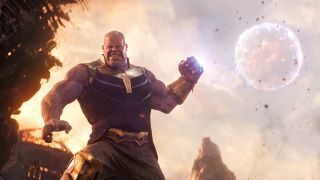 The blood, meant to represent everyone who Thanos bumped off at the end of the movie, was eventually removed because “it got a bit dark,” according to DeLeeuw. All in all, that’s probably for the best. Not only would that have been depressing as all hell, seeing a stream of blood lap around Thanos’ ankles would only have taken away from, perhaps, his one poignant moment in the entire movie. Besides, when was the last comic book movie you can think of that even really zeroed in on the blood? But if you’re really keen on seeing Thanos dip his toes in the red stuff, head to 3:43 in the link above for the cut first draft that would’ve seen the movie have an extremely bloody ending – in more ways than one. This doesn't change the fact that the Avengers: Infinity War ending was depressing as heck - read on for some of the questions we had about it.